If you’re seeking to advance your career and or take yourself to the next level, then you’ll want to bookmark this list of career websites. The internet though full of advice can get pretty noisy. So if you’re looking for a job or seeking opportunities, in hopes of helping you save time and energy I’ve rounded up a list of some of my best career websites. 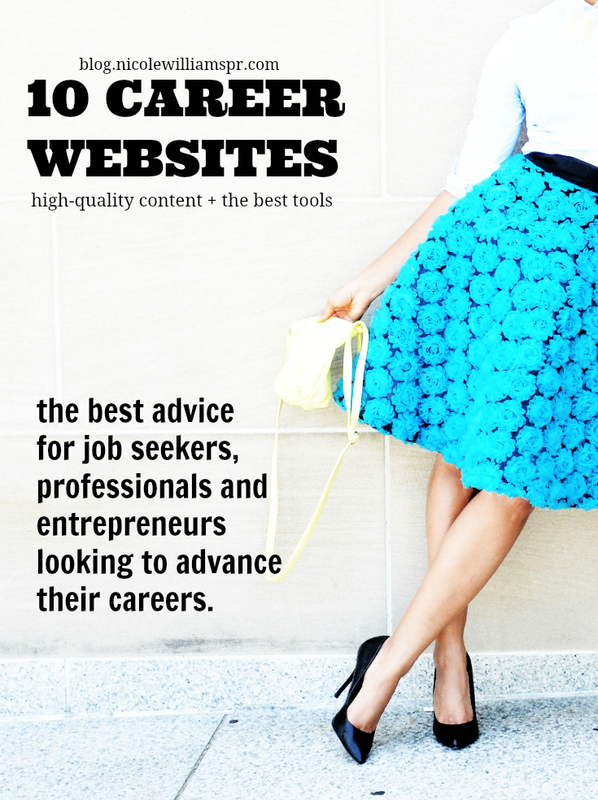 These are career sites that have shown significant expertise. I frequent them because they offer some of the best tools, are full of high-quality content and advice for job seekers, professionals and entrepreneurs looking to advance their careers. Don’t get me wrong, I’m not telling you to spend all day on the internet, reading career advice or sending résumés into the abyss. However, these career websites should be used as a guide to help with your job search basics, interview preps, and opportunity options. LinkedIn - This site is a business-oriented social networking service mainly used for professional networking. This is a quick and easy way to set up a professional profile, resume or portfolio for marketing yourself. You can Manage your professional identity, build and engage with your professional network, as well as research and apply for job listings. CareeRealism – With the motto “every job is temporary” they’re well known for daily career tips via their newsletter, live webinars and video tutorials. Their experts must proven and meet the strict criteria for contributing tools, information, and resources to ensure readers are getting cutting-edge advice to aid in all aspects of career development. Career Contessa - This site is focused on career advice for women through inspiration, information and direction. Here you will enjoy honest conversations by real women about work and life—to help you achieve fulfillment and balance in both life and career. Career Builder (The Hiring Site) - This site provides a community from the perspective of a hiring manager or an employer seeking valuable insights. This is a great resource for those seeking to maximize the way you target, engage and attract people. The Muse - Touting themselves as the ultimate career finder and guidance destination, they offer exciting job opportunities, expert advice, and a peek behind the scenes into fantastic companies and career paths. CollegeRecruiter - If you’re a college student searching for internships or recent grad hunting for entry-level jobs and other career opportunities this is for you. They’re the leading niche site for college students featuring well over 25k pages of articles, expert questions and answers, job listings and other career-related content. Prolific Living - Need a little jolt of inspiration to help you pursue your goals? Farnoosh Brock left a successful corporate career to offer practical advice on getting to know yourself, finding your path, and staying motivated in your corporate job. She speaks authentically from experience because she’s been through personal struggles herself. Penelope Trunk – Looking for a raw and honest no-nonsense type of resource? Then Penelope trunk is the place for you! Penelope says things like no one else can and of course with great insight and a bit of humor. Women On The Fence - This site is for women who find themselves sitting [on the fence], in life, business, or love. Pretty much for anyone struggling to move beyond their challenges. You’ll find inspiration from all walks of life to dealing with the boss from hell, dealing with juggling it all, and how to profit from your passion. Corporette - Here Kat Griggin offers fashion and lifestyle resource for young professional women through her award-winning blog. You'll find wardrobe advice, shopping tips, trend alerts, and tricky workplace style questions. I know I said 10, but here is a little cherry on top. If you're looking for someone with a track record for helping to make professional advancement and fulfillment accessible, then check me out over at Nicole Williams Collective. I'm a communications professional who specializes in marketing and career development that aims to make professional advancement and fulfillment accessible. What are your favorite career websites?